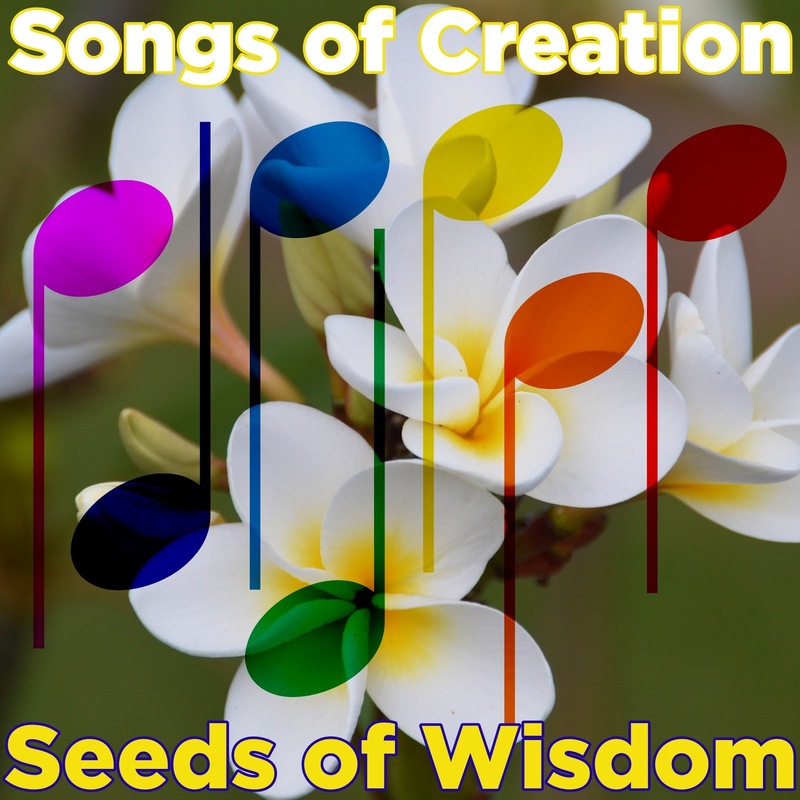 How to better welcome the New Year but with the Creation Story! This time we will read and rejoice in the creation story from the Gospel of John - the opening hymn about the divine Word which formed and shaped, created and saved the world. Almost everyone is familiar with the creation in six days while ignoring a wide and wild variety of biblical creation stories (by fight, procreation, craft...). Probably most neglected and least recognized as such are the New Testament creation stories. The opening hymn of the Gospel of John (1:1-16) is just one of them. Then there is Luke’s summary of Paul’s sermon in Athens (Acts 17:22-29), another Early-Christian hymn in the epistle to Colossians (Col. 1:15-20) or an apocalyptic vision of the new Creation at the end of the book of Revelation (Rev.21). 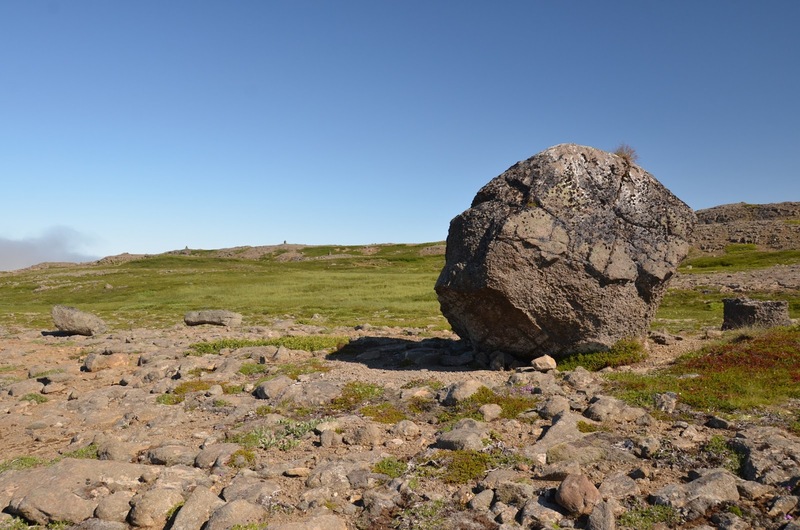 These Early Christian Creation Stories are mutually quite diverse, but they have one in common: they take seriously their contemporary intellectual and social milieu, and they express their Christian faith in their current idioms. I just wonder whether and how would they be inspired and how would they incorporate our current expanding world-view? How would they integrate faith and for instance the Star Nursery LH95 from the Large Magellanic Cloud or the ever growing number of planets orbiting other stars and growing certainty of other worlds with extraterrestrial life? We will welcome the New Year 2016 by asking, celebrating and rejoicing in these great questions of the ongoing, unfolding, Creation/Salvation Story. On this picture is the stars-birthing part (a stellar nursery LH95) of the Large Magellanic Cloud. in handwriting roughly resembling the Codex Sinaiticus. here he is about 90 years old overexposed with 'Ahu'ena Heiau. A century ago a young Jewish German intellectual Martin Buber had an introspective brainwave. He realized that modern philosophy and theology generate alienation. The more we can say about each other or about God, the more lonely we become. The very act of descriptive speaking and objective observation is putting distance between us and those about whom we speak. He observed that this reality is deeply coded in the essence of our language; “I” relate to “You” differently than “I” relate to “it” or “s/he”. “I – it” relationship is descriptive, objectifying, instrumental even alienating, while “I – You” relationship, at least in its pure form, is direct, eye-to-eye, soul-to-soul. This insight became the foundation of the Buberian pronoun-based dialogical existentialism (And was later worked into the book "I and Thou"). I confess that I have been enchanted and influenced by Buber’s linguistic/philosophical/mystical insights. True relationships are built not by analyzing people, but by speaking heart to heart. Similarly a deep faith does not come from speaking about God, it comes from speaking with God. It all makes perfect sense. But it is also very Euro-centric, based on limited European linguistics. Take for instance the good news of incarnation presented to us in the Christmas name Emmanuel (God-with-us). Hebrew just like all the main modern Indo-European languages have just one concept of first person plural “we”. But there are languages with a substantially broader spectrum. 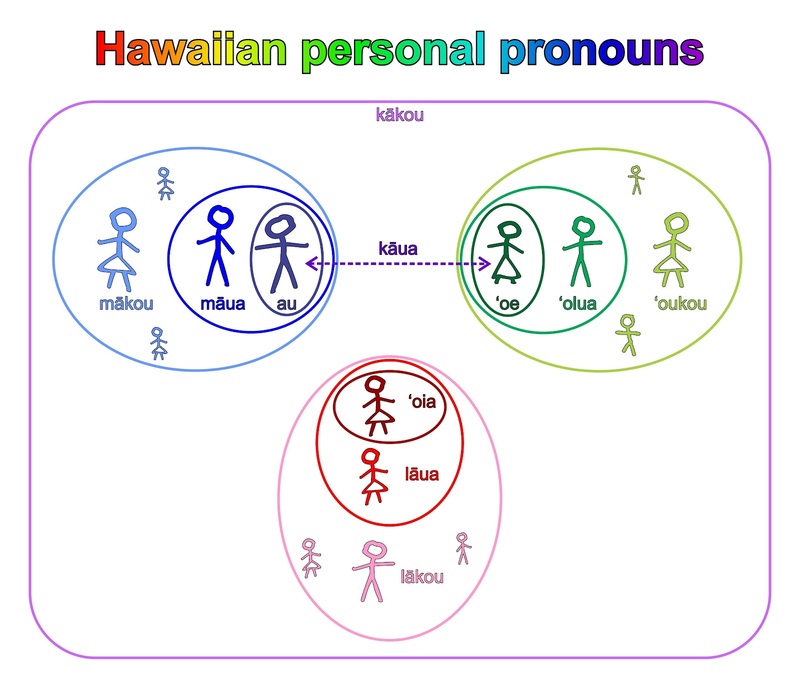 Polynesians, for instance, can distinguish between four different forms of “we” - dual (us two) and plural (all of us), exclusive (us without you) and inclusive (us with you). Such a language would immediately help to sort things out in theology as well as in politics. Imagine hateful political or religious xenophobes showing their true colors by speaking about Emmanuel as “God-with-us-but-not-you” while the angel from the gospel clearly meant “God-with-all-of-us-including-you”! Buber had marvelous spiritual insight when he formulated his pronoun based existentialism. 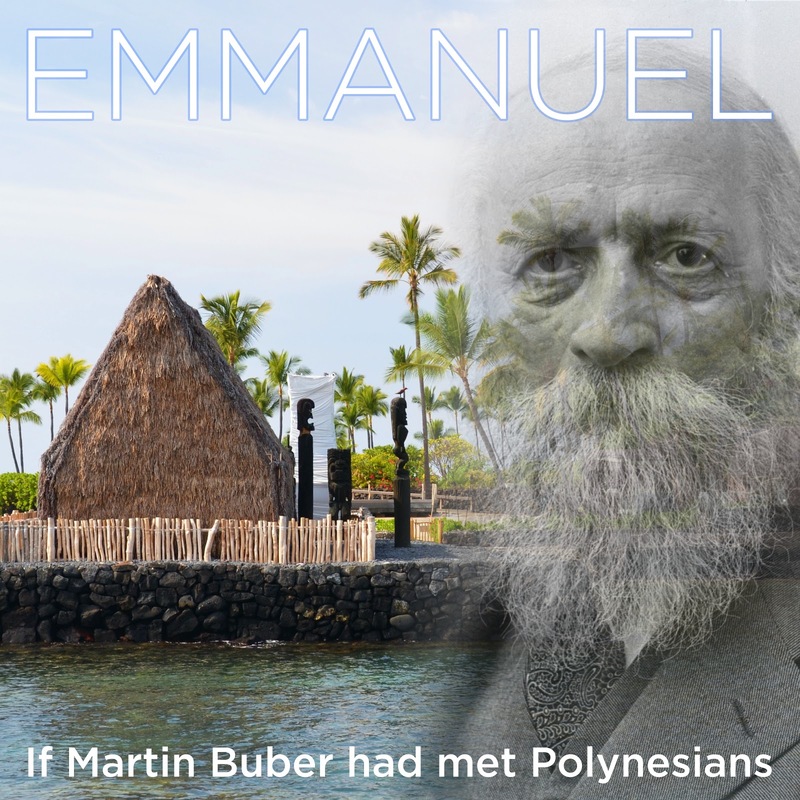 By going global, by introducing Buber to Polynesians (and vice versa) we can gain even deeper and more profound insight. Addition from 2017-03-01 -- here is a chart of Hawaiian personal pronouns which I recently created for my Hawaiian language class. associated in legends with a troll woman Sekolla. 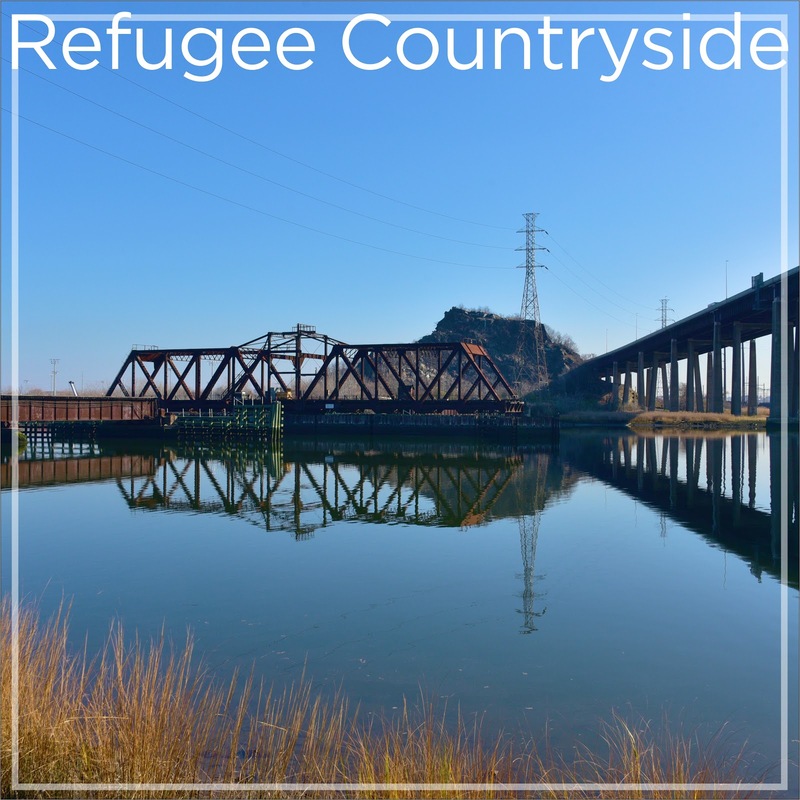 Can a countryside become a refugee, can it be uprooted? I know from my own experience that it can. I was born in Sudetenland, originally part of the Czech Republic which was for centuries settled by Germans. After the horrors of the Second World War, the local German population was expelled and deported to Germany and the generation of my parents was sent or commanded to resettle that land. At that historical junction even the countryside became uprooted and felt like a refugee; most of the local lore, legends, stories, myths disappeared and were forgotten when the Germans left. Before I was born, all these stories, or most of them, vanished with the expelled and deported Germans. It took about twenty years before the new settlers really noticed that something significant was missing in their lives. Of course they started to create their own lore, but it takes centuries. And thus during my childhood some naturalists, anthropologists and folklorists started to work to resurrect and return back at least some of those old stories. I wrote that this kind of geographical lore is part of any old genuine culture. It is also part of biblical stories. Interestingly, these geographical connections are the most neglected part of biblical stories. 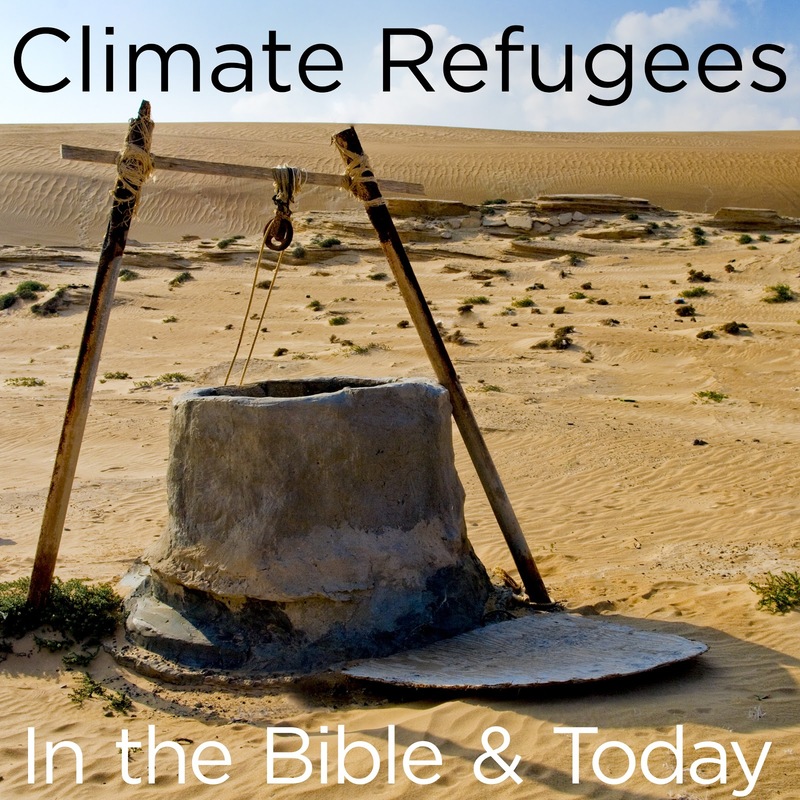 Perhaps it is because we, and most people of faith, do not live in biblical lands any longer. Some fundamentalists occasionally feel the urge to travel to the Holy Lands and trample ancient holy places and thus participate in turning them into an Americanized holy Disneyland. But biblical geographical references are deeper than Jerusalem, Bethlehem, the Jordan River or the Lake of Galilee. They permeate the Bible through and through and are important for understanding its message, important even for us today and important for us here, wherever we live, thousands of miles from the Holy Land. 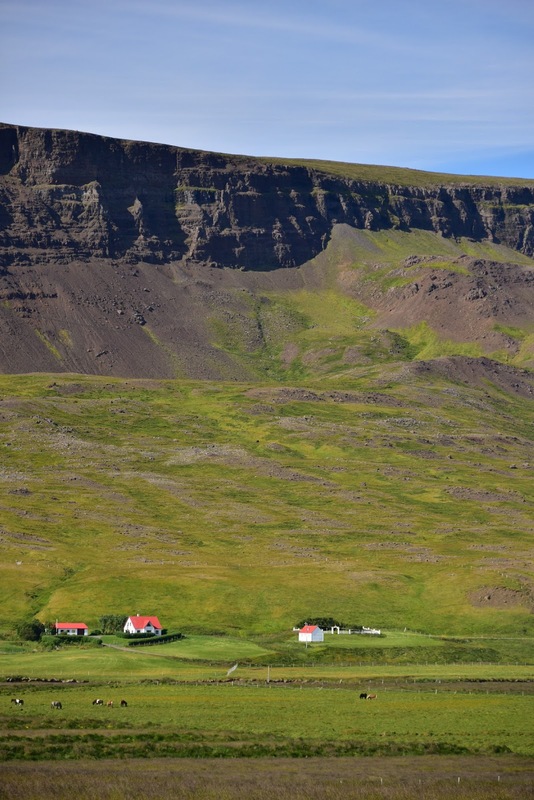 These Biblical examples can teach us to relate and respect countryside around us. Unfortunately the original inhabitants of our country at the Hudson River Estuary are long gone and only the faintest remnants of these old stories are remaining. 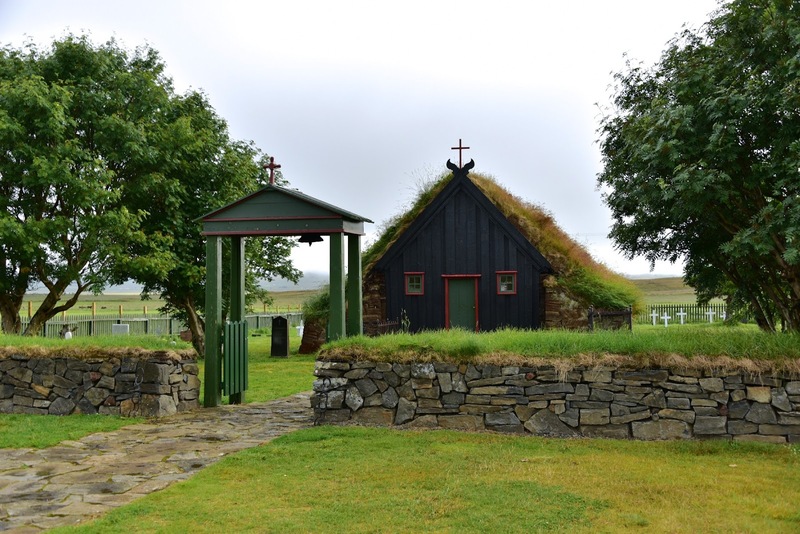 Yet inspired by our faith tradition and re-learning how to be sensitive to the broad environment and country around us, we can start resettling our homeless countryside all about us. Just like with any refugees, we all will benefit from this endeavor. And then look at the sea of people, all those different dresses and diverse headgear! Those are truly crowds of people gathered from all corners of the world, at least as they knew it in XVI century Europe. But please, notice, not all people are interested in Jesus. Unlike more traditional nativity and adoration paintings, this one is not built around baby Jesus. This painting is different, more realistic, and I would say, also theologically more correct. Jesus is born into this world, but to a large degree, the world does not care. The World and its cities live as if nothing happened. Just around the corner people go on about their petty busyness and they do not notice a damn thing. And yes, then we can observe the rubberneckers and nosy folks who just like sensations or at least something, anything, happening. We also know these people with an attention span of minutes, just like today’s media. Then there are also the opportunists who love to use religion to boost their own image and their agendas. Look at those kings in Brueghel painting (and there are more than the traditional three) - at least some of them are recognizable caricatures. Brueghel clearly mistrusted and disliked royalty and nobility - those with power and always seeking more power. And he had an even bigger issue with people bearing arms. Soldiers and lawman ostensibly guard order, and citizen bear arms allegedly for their own protection. As we know from the biblical story, in just few days, many of those arms might be used in mass murder of the innocents of Bethlehem. Just as it happened many times over through the turbulent religious history of Brueghel’s home Flanders in the XVI century. Brueghel had clear artistic intuition. Jesus was born to this world. 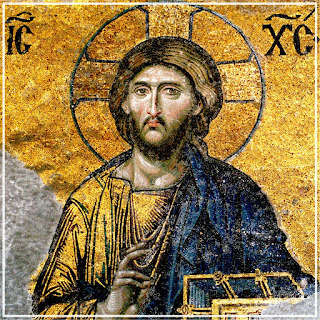 Through his life and especially through history Jesus became surrounded and associated with the sensationalist media and with the opportunists of power but he was and remains, in essence, an incarnation of humanity as God intended. Unfortunately in the alienated and alienating world, it means he was born as a poor vulnerable child in the center of cacophony of the world and away from centers of power. 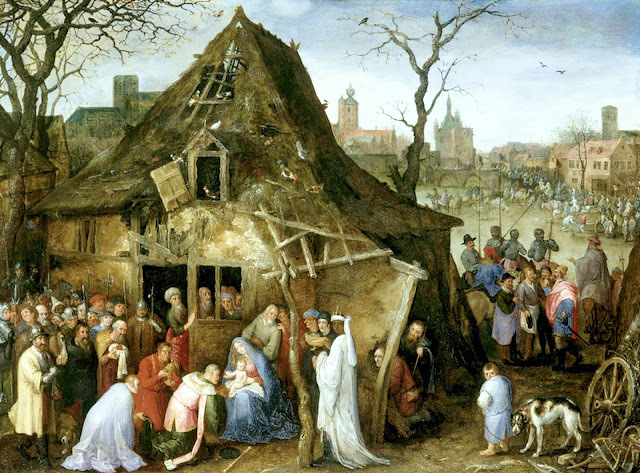 The biblical baby Jesus, transplanted into the early modern Flanders, brings hope to all the lost, forgotten, poor, marginalised, oppressed - and that is the true Good News of Refugee Jesus. Just wonder how and where would Jan paint Jesus today? By the way, the development and composition of this painting was developed and kept in the Bueghel family for generations. The tradition of non-idealised Jesus and Mary and caricature kings started with Pieter Brughel de Oude, was taken and further developed by Jan Brueghel de Oude and later copied several times by his sons Jan Brueghel de Jongere (the Younger) and his brother Pieter Brueghel de Jonger. Both “Jongers” copied works by their father and grandfather and sold them under “Oudes” signatures - speaking of early modern forgeries! So, who knows who exactly made this painting, and does it really matter? It was in this Flemish family. My first American book which I read from cover to cover was "The Grapes of Wrath" by John Steinbeck, set on the background of the Great Depression and Dust Bowl. 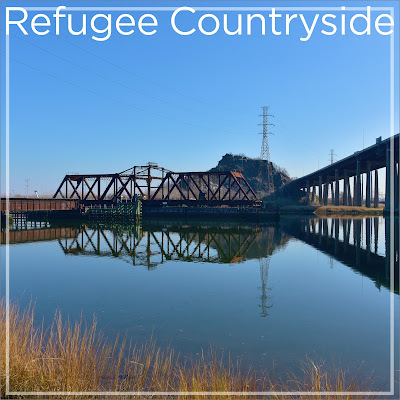 It was an economic and environmental catastrophe which caused mass migration and enormous suffering to about half a million small farmers from Oklahoma and bordering regions. If we want to understand future dangers of the Climate Change (on agenda in Paris this week) it must be immediately stated that the Oklahoma drought, as bad as it was, was just a small regional catastrophe. We need to look deeper into history to grasp dimensions of mass migration, agricultural collapse and societal disintegration caused by climatic changes. We can, for instance, go to the prehistory of our faith and its oldest stories about ancestors of our Judeo-Christian faith. These stories are legendary by nature, yet they preserve traces of historical reality - the collapse of the Late Bronze Age around the year 1,200 B.C.E. When we hear in the Bible about ancestors forced to migrate by long lasting drought and crop-failures, it might be the last faint memory of these real catastrophic, subcontinent-wide events. 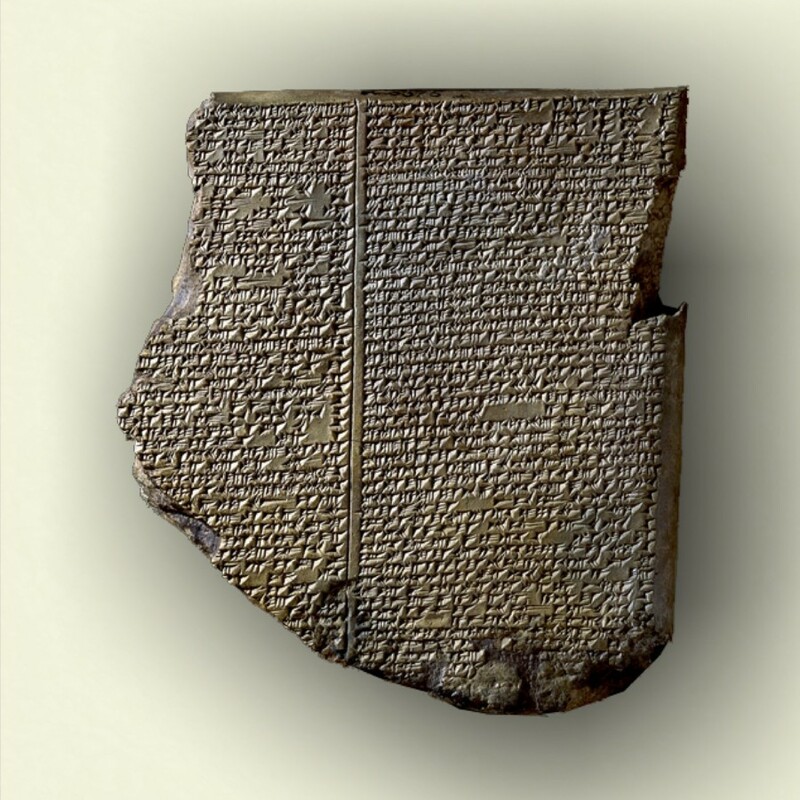 In a preserved cuneiform letter written just before the collapse, a small shipload of Egyptian grain was referred to as “a matter of life and death” for an entire city (tablet RS 20.212). It is sometimes unsettling to know a little bit of ancient history. It is even more so, because as I have mentioned, the Late Bronze Collapse was caused only by a medium size climatic change. Dust Bowl was regional, Late Bronze Collapse was subcontinental, Global Climate change is going to be, well, Global, and therefore many times larger and more powerful. 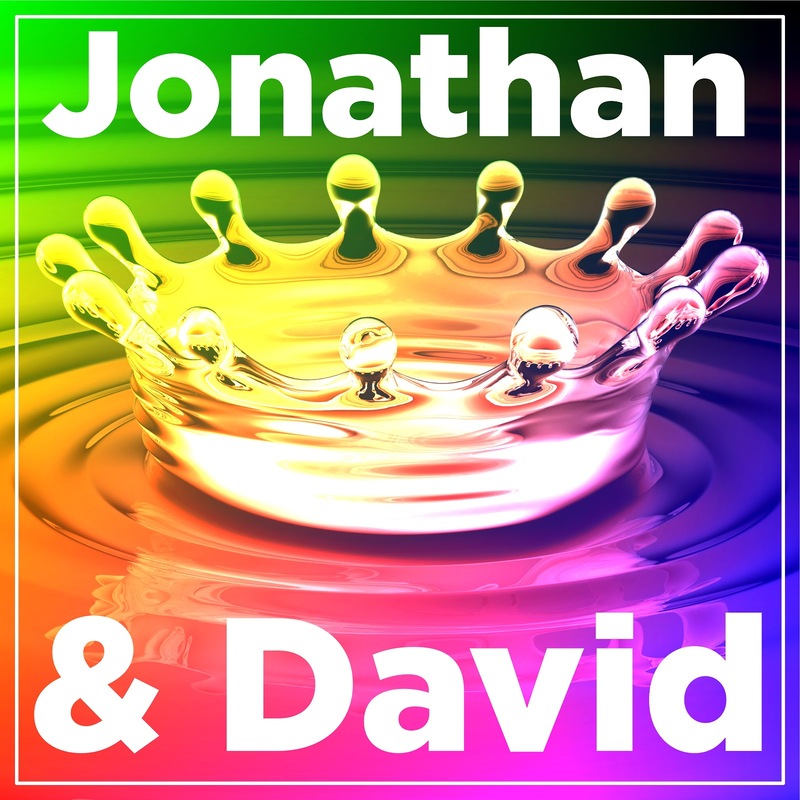 But our faith and the treasure of the biblical stories paint not only these dark pictures, they also offer positive models of behavior and stories of hope. If you dig deep into the biblical stories, you can come across springs of hope. And that is what we will do this Sunday; we will dig with Isaac some wells for refreshing hope. 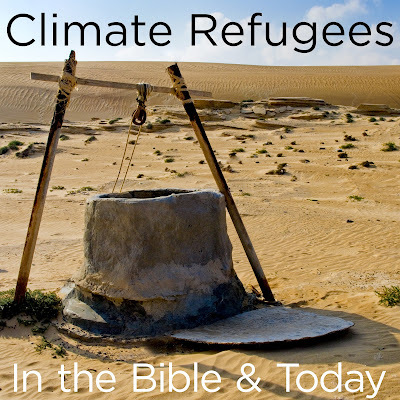 We will learn how to be or how to care for climate change refugees. *) This is of course a gross simplification of complex cultural and historical developments. But the general gist of it is correct. I received my PhD for the study of literature which was written immediately preceding this Late Bronze Age collapse. This Sunday we will celebrate the Biblical Thanksgiving (according to Deuteronomy 26). 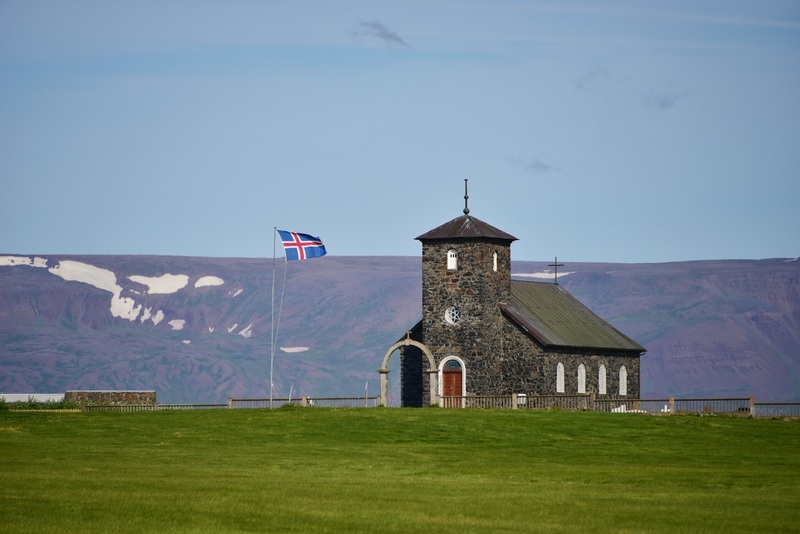 It shares many surprising similarities with our current American tradition. Just like our American tradition, Biblical Thanksgiving does not have solid historical roots. The American Thanksgiving has flimsy historical grounding. 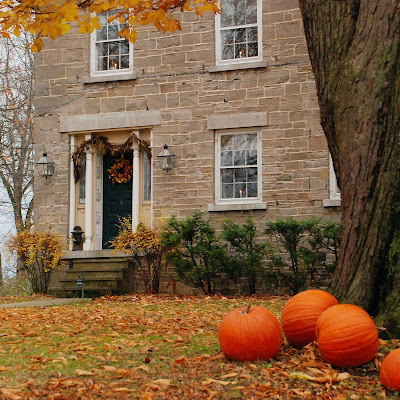 Early European colonists did celebrate Harvest Home, but as such it took place much earlier in the season, just like it is customary in Europe. 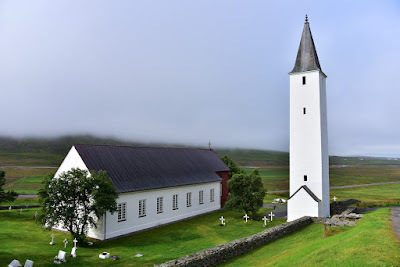 Colonists were not dressed in those black and white costumes, that was for them a dress for church and not for a joyful festival. They did not eat turkey but venison and they would hardly recognize most of our traditional thanksgiving dishes. All these aspects were designed as part of national mythology in the Victorian Era. The same is true about a Biblical Thanksgiving which also had very little historical grounding and we will touch upon it. Just like our American tradition, Biblical Thanksgiving was created for political/ideological reasons. American Thanksgiving in its current form has been designed to inspire cohesive spirit in difficult and dark times of the Civil War. (Have you noticed that the media never forget to report how our soldiers also celebrate?) Many aspects of a Thanksgiving celebration betray its historical origins. The story about Pilgrims and Indians, the location of the story, depictions of ancient dresses, even traditional thanksgiving recipes and order of dishes did not correspond with historical reality, but were an idealized projection - how people in the 1860s in the Union part of the Nation visualized the early colonists and their feasts. Similarly ideological purpose can be observed in Biblical Thanksgiving and we will touch upon it. But regardless of all these falsifications, American Thanksgiving just like the Biblical Thanksgiving has an important underlying message. Most of what we tell about Thanksgiving and what we eat on Thanksgiving and what we do on Thanksgiving was cooked by national ideology. But underneath all of it is an undeniable reality of a nation of migrants - some refugees, some economic migrants, some opportunists, some idealists, but almost all of us (unless you are 100% Native American) relatively recent newcomers. And this message is also true about the Biblical Thanksgiving. It might be historical fiction, but the powerful message of the Biblical Thanksgiving was clear - it was a feast of migrants and refugees. Join us, migrants and refugees, in Thanks Giving. This week I picked for our bulletin cover this monumental sculpture called “Mother Peace” by Mark di Suvero. 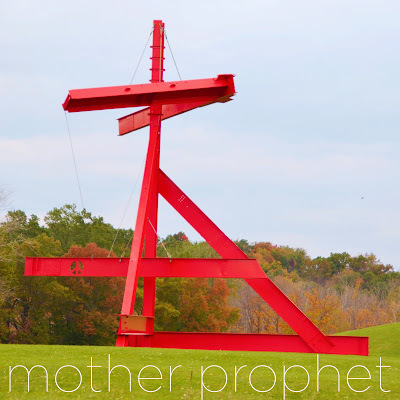 It is a 42 foot tall red steel tower with several moving parts. 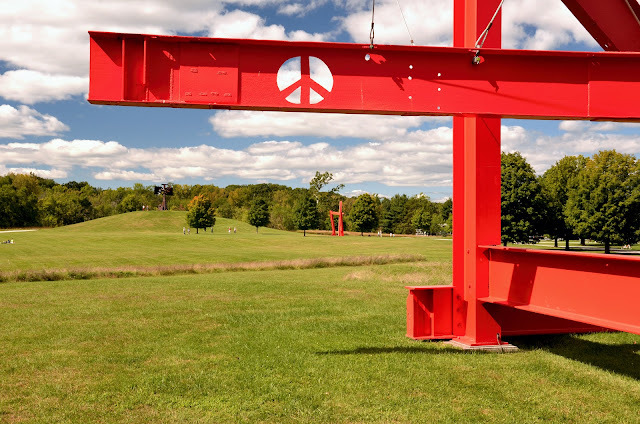 At the top is suspended A large “V” and beneath is attached a large swinging ram with a prominent peace sign burned-cut into it. Mark di Suvero originally installed it in 1970 in front of Alameda Courthouse after he was sent to jail for anti war protests. Local judge and conservative potentates were provoked by the peace sign and symbolism of this sculpture and had it eventually removed in 1974. Nevertheless, Mother Peace found a new home and it still gently swings in the wind prepared to crush open gates of militarism and injustice. I picked this sculpture because this Sunday’s lectionary reading brings to us the story of Hannah. She was a mother of a prophet Samuel but herself the eloquent prophet in her own right. She will teach us how bitter experiences of harassment and persecution can sharpen our sense of justice and teach us to stand for what is right. 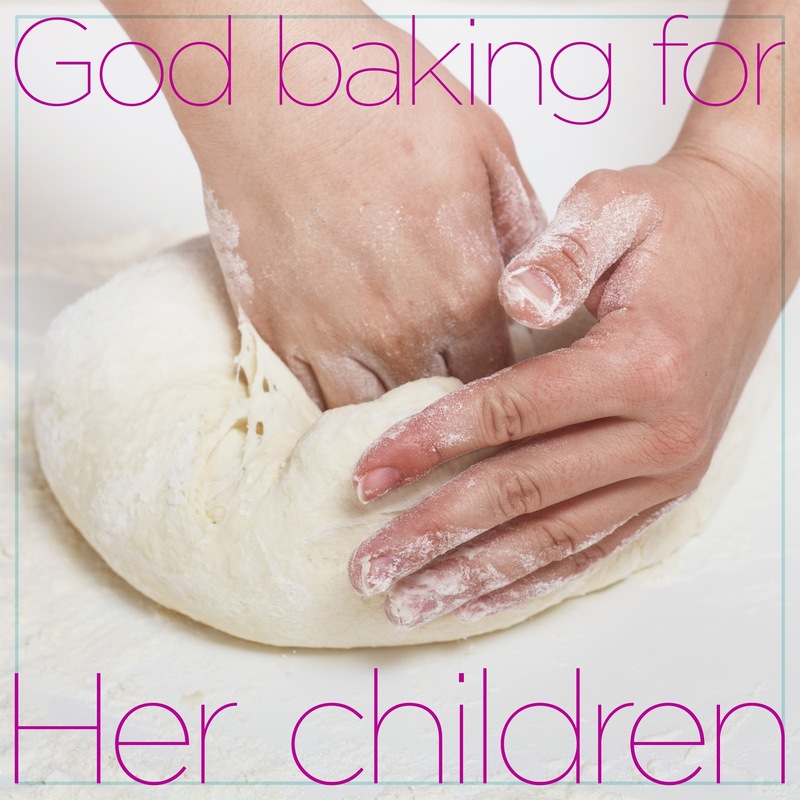 Interestingly in our faith tradition, this is the role often reserved for women and mothers. Many of you might know that English is not my native language. No matter what I do, I am bound to make mistakes, sometimes stupid, sometimes clumsy, sometimes unnecessary, often funny. 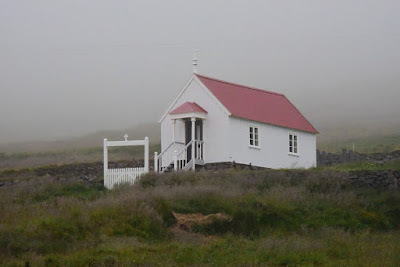 Since the inception of this blog I had a great and selfless helper - Mary Birchard - who regularly checked my spelling, tried to cut up my unnecessarily long sentences, corrected my “international” prepositions and helped me especially with the tricky (tricky for me) English articles. She often joked that she would leave me two boxes one with “a-s” and the other with “the-s”. Unfortunately, she did not! Mary died suddenly yesterday and I am heart-stricken. But Mary left me something else and even more important than English gramar - she initiated all our family into the love of birds. I learned to look around for birds. And especially during my different exotic holidays I used to play with Mary “Can-you-name-this-bird?” game. I would take a picture of a bird, send it to Mary and within few moments she would respond with the name. Always she did it, and she was never wrong. Just a few times she would give two options, and one was always correct. 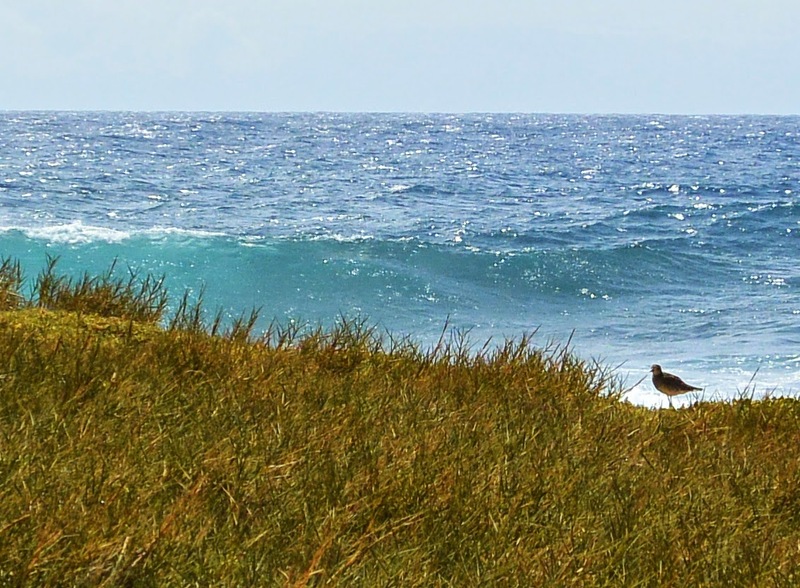 I attach a picture of a Pacific Golden Plover which I took on the ancient Hawaiian burial ground in Ka‘u. Golden Plover is one of Hawaiian ‘aumakua, in Greek psychopompoi. May the birds she loved so dearly accompany Mary on her journey! Days are getting ever shorter and colder, the sun, even at midday, is lower in the sky. (This Sunday is the end of Daylight Saving Time!) Tatters of cold mist hang on leafless branches of bushes and trees. There is still no snow to brighten the days and nights, the land is wet, cold, dark and brown, and nature is shutting down in preparation for her winter sleep. This is the season to remember our dead with respect and thankfulness. In my native land this is the season to visit family graves. People decorate graves with mums and other hardy autumn flowers, and also with bright fragile straw-like immortelles. And of course candles and oil lamps are lighted and kept shining for at least two days. In this autumn season cemeteries and kirkyards of Central Europe, which had been dark up until then, suddenly burst out with lights and look almost like another city illuminated with hundreds of flickering flames. Decorating graves and lighting candles are ancient customs of the Feasts of All Saints and Souls. They predate Christianity and harken back to ancient Celtic roots of my native land. Celtic people called this holiday Samhain and perhaps more than any other holy day it was a liminal season, a time when the boundary between our world and the other was thinner and could be crossed, especially from the other side. Thus besides fires and lights lit for those who had passed away, Celts used to keep an extra place at the dinner table or by the family hearth for those who departed and should they come for a visit, they were to be treated with kindness and respect. Only bad, guilty and disrespectful people were to be afraid of their departed ancestors and family members. All other awaited this season perhaps with some trepidation but also with excitement. These are the deepest and also more genuine and spiritual origins of our commercialized and secularized Trick-or-treating and other Halloween customs. Now think, what does it say about our culture if frightening each other and fear of ghosts (be it playful and teasing), so completely underline our modern celebrations! Does it mean that we feel guilty because of our disrespect towards our ancestors? 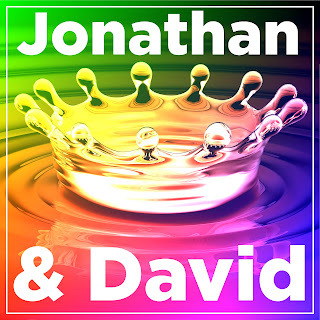 Of course, many can claim that all this is shallow and foreign to the core of our Judeo-Christian faith. But surprisingly, the Hebrew Bible also knows ancestral spirits, albeit their presence is predominantly hidden, suppressed and largely neglected. 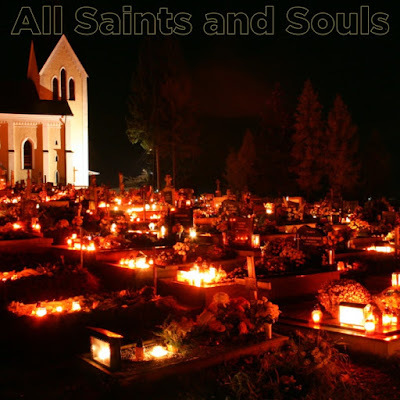 On this All Saints Day we will search for the biblical healing ghosts and hear the prophetic promise of their resurrection. Come to remember and celebrate our departed and be healed. Martin Luther made this comment at the family table in April, 1532. It was faithfully recorded by his friend and colleague Johann Schlaginhaufen and eventually published by Johannes Mathesius as Table Talk #1457. There are thousands of similar off the cuff comments and observations made in the characteristic robust and witty style of the Wittenberg Reformer. They reflect relaxed setting, intimate atmosphere, and informal, often touching conversations with family and friends. Table Talk (Tischreden) makes it clear, that the Reformation was so much more than just a new theological teaching or reformation of the Church. It was a radical shift in the very structure of society. For instance, we can observe the emergence of an intimate family founded in love, respect and mutual care. That nun which Martin spoke about was his wife Katharina von Bora. He lovingly called her “my Katy”. She escaped a monastery and eventually married “Her Doctor”. Together they ended up having six children brought into this mutually respectful, sometime bantering, but always loving relationship. She admired the somehow impractical, idealistic and folksy Doctor of theology, while he deeply respected her motherly instincts and admired her economic prowess (she took care of a household of about forty members!). But Katy was not just an effective “hausfrau”. Even while nursing babies she actively participated in the political, cultural and theological discussions which were led at least partly in Latin. Thus this marriage and family of a former nun and a former monk was so much more than just another family, it was an integral part of the thorough reformation and realignment of medieval times and emergence of early modern culture. If we celebrate Reformation Sunday, we must not forget Katy Luther. 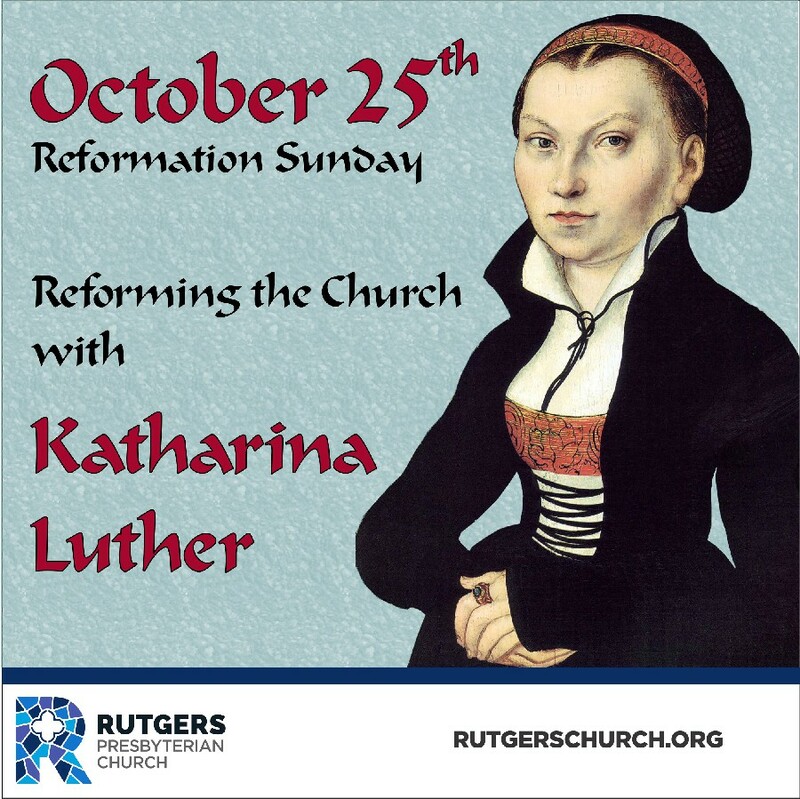 Come this Sunday to celebrate Reformation, one of its heroines, and its changing cultural paradigms. Last Friday my wife Martina and I went to visit the Arctic Circle. 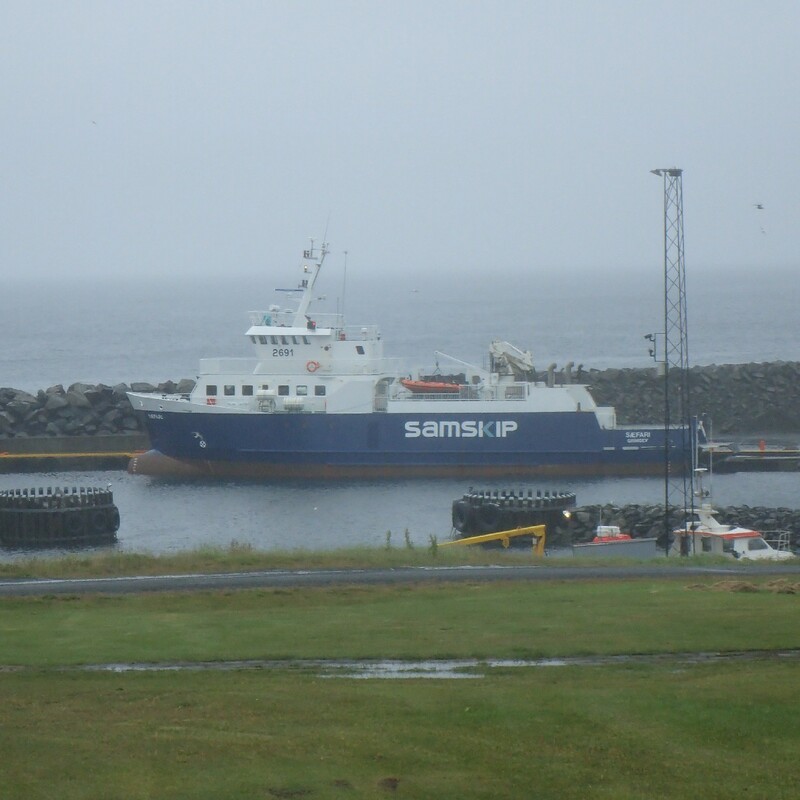 We took a 40-mile long ferry ride to Grimsey, a tiny island off the northern coast of Iceland. As soon as our ship left the port, a junior steward appeared and diligently handed out paper bags to every single passenger on board. When we left the relatively calm waters of the fjord Eyjafjörđur, it became clear why. Our reasonably sized ferry was rocking up and down and from side to side. Sea water was splashing and pooling on all three open decks and spray driven by the wind was shooting above the ship from bow to stern. Soon almost all the passengers were seasick. For those few of us who were not sick even standing upright was demanding and getting around became a quite strenuous exercise. It was the longest three-hour ride I have ever made. And mind you, this was what local seamen call nothing more than “choppy sea”. The weather more or less normal for the end of summer (temperature in the 40s, low clouds, some drizzle, some rain with a little bit of melting sleet). Our short sail through the coastal Arctic Ocean made me acutely aware and deeply respectful of the elemental nature and almost mythic power of waters. These same choppy waters rewarded us with sightings of a whale, some dolphins and a number of seabirds. I could not take a single picture, I needed both my hands to keep steady. But on the island I was able to photograph (in short window between sleet showers) Atlantic Puffins just before their migration south. The very same waters can be life threatening and life giving, harming and balmy, threatening and healing. This Sunday in worship we will attempt to reconnect our faith with waters, a tamed but ultimately unbridled elemental force of God’s creation. This reconnecting can have a cleansing and healing power for us and our faith. Come to sing with us the Song of Waters. On June 21st this year I received a very special gift. It was Sunday and I preached about caterpillars and worms. A thoughtful parishioner brought me a bin full of composting earthworms (Eisenia Fetida). Ever since I have been keeping them, feeding them and observing them on our balcony. It has been for me a real and highly rewarding spiritual exercise. Earthworms are amazing creatures; very quickly they turn any food leftovers (but especially fruit and vegetable scraps) into amazing dark rich humus. Our compost bin has almost no smell, we have only a few little fruit flies and only an occasional minor flair-up of mold. But all of those “unpleasantnesses” are actually parts of a natural process of soil making. Worms are amazing, but the very humus and soil making is even more amazing. It might look like a bin of dirt, but in reality it is like a small city, a small microcosm of diverse organisms living together and transforming our refuse into a life-giving substance - the soil. It is pocket-size ecology in action. Pope Francis in his recent encyclical letter “Laudato Si” wrote: It may well disturb us to learn of the extinction of mammals or birds, since they are more visible. But the good functioning of ecosystems also requires fungi, algae, worms, insects, reptiles and an innumerable variety of microorganisms. Francis is absolutely correct, well informed and oriented not only in spiritual but also ecological matters. We usually don’t pay much attention to what we call earth, ground or even dirt. But soil is not inert; it is very much alive and our lives depend on it! Without soil teeming with well-balanced life, all other life of plants and animals would be impossible. Interestingly our faith tradition shares this deep appreciation of earth. These aspects of our faith have been long neglected, but our faith tradition respectfully and consistently ascribes to earth personality and even an independent agency. Join us this Sunday for a celebration of earth - ground, dirt, dust, soil teaming with life. God in the Hebrew Bible and Jesus of the New Testament called her partner and collaborator in bringing forth and nurturing life. Now imagine what industrial agriculture does to this fine-tuned equilibrium of living creatures in the soil. Blasts of industrial fertilizers, herbicides and insecticides are poisoning microorganisms. Antibiotics leaking and leaching from gigantic animal farms are exterminating the whole spectrum of soil bacteria leaving behind impoverished biodiversity and often virtual deserts. 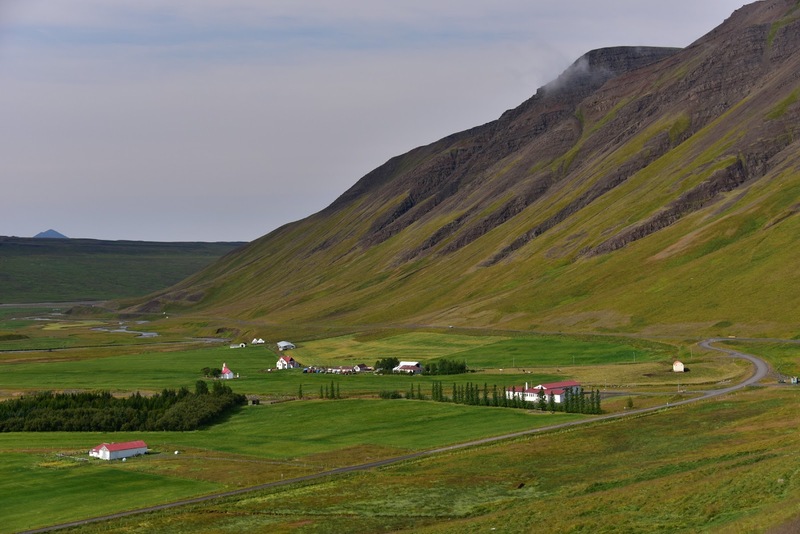 Some fields are so degraded that without artificial fertilizers they would not be able to support any crop. True soil is not inert, it teems with micro-life and our lives depend on it! 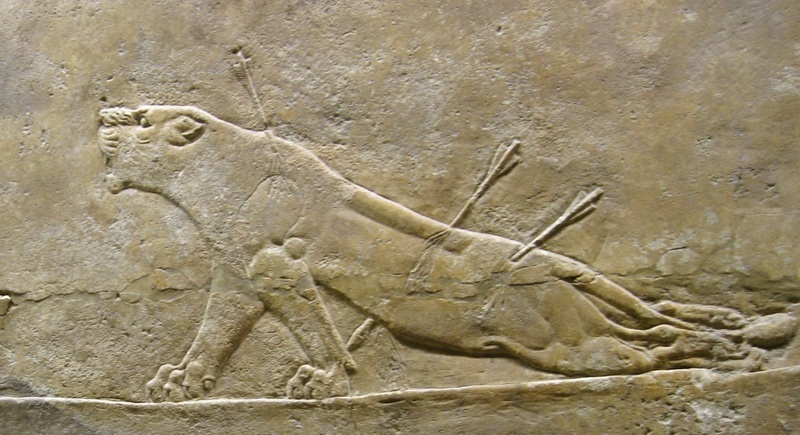 Shooting a lion with an arrow? Wounding him and finishing him up later in a volley of more arrows? 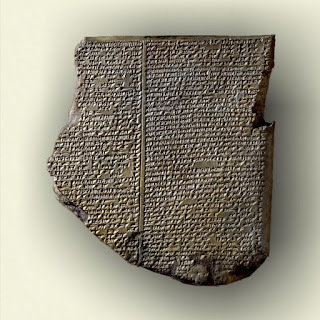 That was a pastime of ancient nobility and kings, but especially beloved by Neo-Assyrian kings. 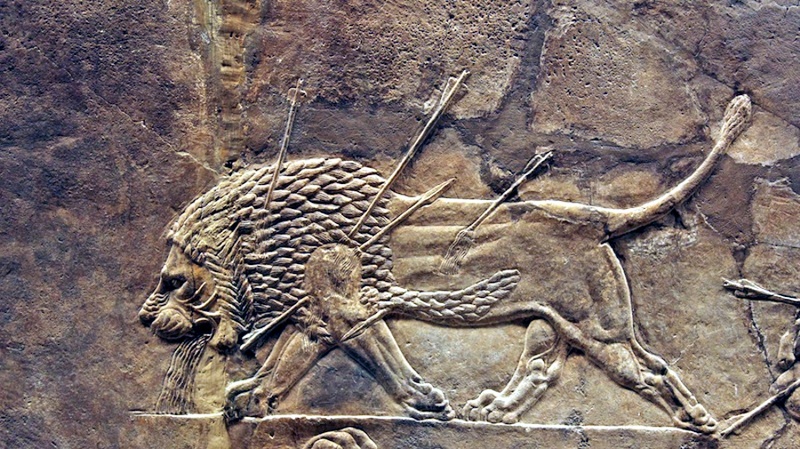 I saw this basrelief in the British Museum - it was discovered in ancient Nineveh. In fact, the original lion hunt relief covered an entire wall. On that wall were several dozens of lions and lionesses transfixed and killed with arrows, swords and spears. 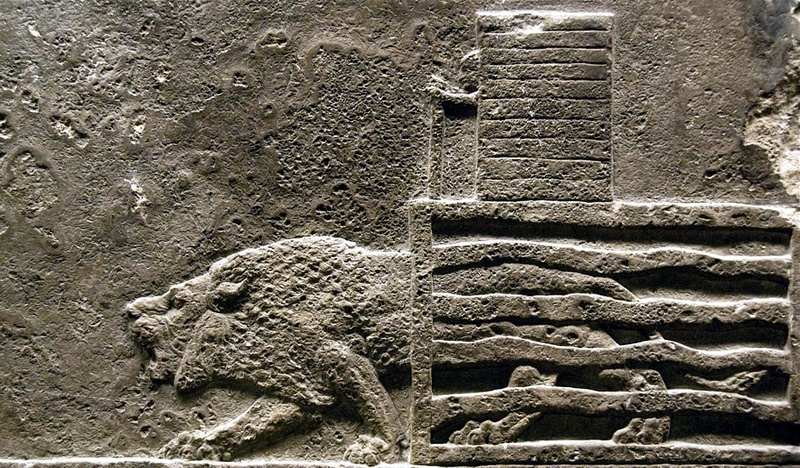 This gory display decorated a wall of the private living quarters in the north palace of King Ashurbanipal, and was by no means the only Assyrian depiction of a lion hunt. Now imagine that all these ancient basreliefs were originally painted in vivid colors: dark red blood running from the arrow wounds, bright blood gushing from lions’ throats. We even know that when Assyrian nobility hunted their own lions and other big game to extinction, they started to import animals in cages from subjugated lands. Is it any surprise that these psychopathic Assyrians did not have many international friends and had one of the worst reputations among ancient empires? Recently we were reminded that America has its own subculture of hunters with a similar regal itch. Walter Palmer is just one among a number of those who travel the world and buy so called “canned hunts,” which means to pay large amounts of money for killing protected and endangered animals. Thankfully, public outcry (even in Minnesota!) showed that we will not tolerate such brutalization (Assyrianization) of our society. This Sunday we open a series of seven worship services dedicated to the environment and inspired by the Earth Bible project. The series is called Songs of Creation and this Sunday we will sing the Song of Sanctuary - discovering and restoring the sanctuary for lions and all living beings. in a number of days you will get it back. you never know what risks lie ahead. The opening advice sounds rather strange. Bread placed on the surface of water would hardly return in days, it will probably float for a moment, soon it would soak up water, sink and start to disintegrate. This does not resemble a gesture of selfless generosity; it is rather a blatant example of an insane wastefulness. This strangely disjointed advice certainly looks a little crazy, until we hear that this was exactly how ancient people made and enjoyed their beer! They would malt(sprout or germinate) barley, grind it into meal, bake it into loaves (thus caramelizing the sugars), float bread in a water-filled jar (holding several gallons). The bread would dissolve in the water, catch yeast from the air, start fermenting and in a few days they would have the brew. They would season it with spices, honey or date sugar and there would be enough for seven or eight people to enjoy this ancient variety of beer (it was about 2-3% alcohol). Most commonly they would drink it through long straws made of reeds with strainer tips at the bottom to keep the dregs out. This beer making is documented by artefacts, reliefs, inscriptions and archeological finds from all over the Ancient Middle East. It has also been re-created by modern experimental archeology. In the summer you can try it yourself at home. Just cast your bread upon the water; in a few days you would be able to invite friends for a really strange (some would say disgusting yet certainly unique) drink. Poor fundamentalists, if only they knew! Largely ignorant of ancient history and archeology, they endlessly sermonize about the blind trust and their conservative do-gooding. Come this Sunday, we will celebrate another, similarly surprising aspect and use of the barley crop. We will rejoice in an ancient model of unlocking of the harvest, redistribution of wealth and feeding of the multitudes. When you read the Little Red Riding Hood story, you know that speculation about talking wolves or the size of their stomachs is missing the point. You know it, because you are familiar with other similar stories such as Snow White, Cinderella or Sleeping Beauty. When you watch Tom and Jerry, you are not upset by the horrendous level of violence and abuse, because you also know The Roadrunner and Wile E. Coyote, South Park, Sponge Bob SquarePants and many other cartoons. In both these cases we have a basic frame of reference; we understand the game. But when people hear about the grotesque, self-serving, even malevolent miracles in the Acts of Apostles - for instance St. Peter killing people by a curse - many modern people are left disoriented, perplexed, and vulnerable to unscrupulous and abusive manipulations by fundamentalists. It is so because the Acts of the Apostles is the only book of its kind in the Bible and thus people don’t know the coordinates, don't know its literary genre. Yet there is a whole bookshelf of similar ancient literature - books of the acts ascribed to different apostles: Thomas, John, Paul and Thecla to name just a few of the oldest and best known. These books are not in the Bible, but they can help us understand and appreciate this early church’s most popular and entertaining genre of literature. This Sunday we will continue our intermittent series about biblical (or in this case almost biblical) insects; allowing apostolic bedbugs to introduce us to this peculiar genre of the early Christian Acts of Apostles. An ancient burlesque miracle story about these most unpleasant insects will teach us how to resist similarly unpleasant, abusive and manipulative christian fundamentalism. And don't worry, as much icky/itchy as it sounds it is actually eye-opening fun. Grotesque, scary or funny miracles are a natural part of the genre of Acts, just like talking animals are part of fairytales, or the exorbitant violence of a cheeky mouse is a part of cartoons. On the first day we came to some godforsaken inn, and when we were trying to find just any bed for John, we experienced this amusing event. In one corner there was a bed without any mattress, so we covered it with our cloaks and asked John to take a rest on it while we prepared to sleep on the floor. As soon as John lain down, bedbugs came out and started to bother him. They pestered him more and more. 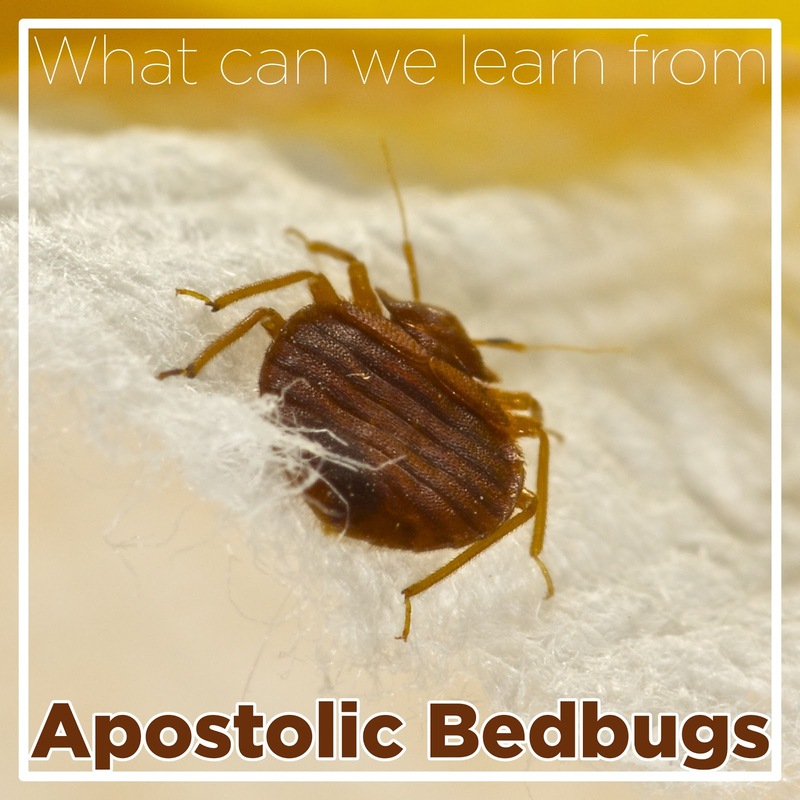 It was almost midnight, we all heard him say to them, ‘I ask you all, you bedbugs, be considerate; leave us your home for this night and go to rest in a place which is far away from the servants of God!’ And while we chuckled and talked for a while, John fell asleep. We chatted a little longer, and thanks to him we were undisturbed all night. In the morning, the next day, I got up first, and with me Verus and Andronicus. And right behind the door of that room in which we slept we saw this entire regiment of bedbugs lined up on the doorstep. We went all the way out to see this spectacle, we even woke up other brethren- John was still asleep. When he woke up we showed him what we had seen. And sitting up in bed and seeing all those bedbugs, he said to them, ‘Since you have been so reasonable, and heard my rebuke, you can now return to your place!’ And as soon as he said this and got up from the bed, the bedbugs ran straightaway from the door to the bed and up the legs and disappeared into the joints. And then John proclaimed, ‘This creature listened to the human voice and kept quiet and was obedient. We hear divine voice, and yet don’t take God’s command seriously. For how long would this go on? 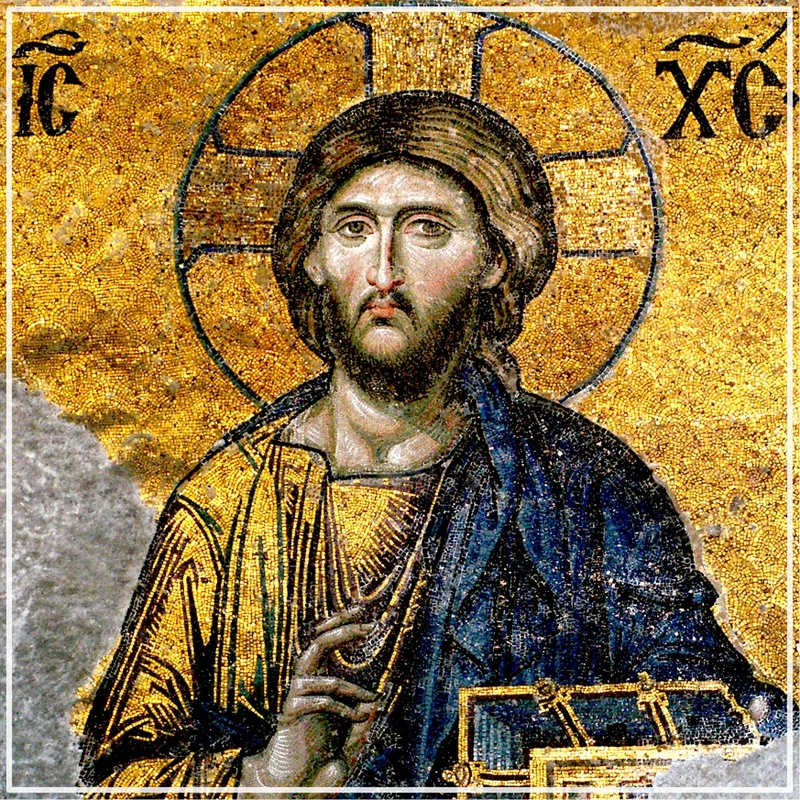 Teaching Jesus - mosaic from Hagia Sophia. Our Father who are in Heaven... We know this prayer. We recite it every Sunday. Many of us say it every day. This prayer is written in our memory and rooted in our hearts. It is an essential part of who we are as Christians, who we are as followers of Christ. Into the words of this prayer Jesus encoded deep yearning for divine rule, for justice, fairness and basic human dignity. The first set of petitions ask for the holiness of the divine name, the coming of divine rule (God’s kingdom) and the divine will on earth as it is in heaven. The next set of petitions explains what this divine rule on earth would change in our everyday lives. First we are taught to ask for food, next for relief of debt and finally to be protected from the inhumane and corrupt systems of the world. Those were relevant requests in the time of Jesus and they remain very relevant in our world. 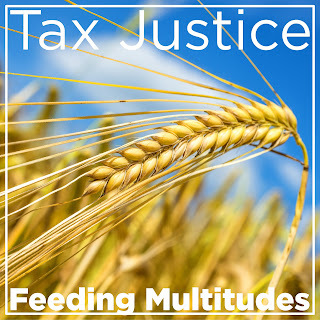 Many people in Jesus’ native Galilee suffered hunger, just like many people do in our world, even in our American society. I meet with the American hungry every Thursday when my church offers free meals for our neighbors. Many people in Jesus’ Palestine were crushed by debt, their ancestral farms repossessed, their livelihoods taken away; sometimes they were even sold into slavery. Unfortunately that is also the lived reality of our world. People are enslaved by crushing debt, thrown out from their repossessed homes and farms. People might not be sold into slavery in our society, yet we all know that such things happen in our world. I meet with Americans who were thrown from their homes when my church offers a shelter for our homeless neighbors. The last set of petitions of the Lord’s Prayer is probably the least understood; in many translations it speaks about temptation and protection from the Evil. With proper exegesis (into which I cannot go here in detail) this set of petitions in its broader context asks for protection from an unjust Roman system which was rigged and stacked up against the poor. No matter what they did and how hard they worked, the system almost always worked against them. And again, don’t we know it?! Unfortunately this is also a lived reality in our world; the economic numbers speak clearly. The supra rich and well politically connected are getting ever richer, while the rest of society is struggling and the poor are hardly preserving their human dignity. I observe it in my Manhattan parish with growing alarm. Something needs to be done about how our social and economic system is laid out; it needs to be made more just. In the least radical understanding this last petition of the Lord’s Prayer asks for substantial tax reform and in more radical version - oh, don’t get me started! I pray the Lord’s Prayer with growing urgency. What I am writing to you today might seem to many Americans as distant as the stone age and similarly irrelevant. It is anything but! Read carefully and you will find these themes (when translated into our modern idioms): corruption, abuse of power, buying influence and offices, miscarriage of justice, cruel and unusual punishment, eliminating critics instead of dealing with criticism, twisting Christianity into a power hungry, abusive and profit-making idolatry... Sound familiar? That is why knowledge of history is essential for moral integrity. By the morning of July 6, 1415 a large stake (pyre) was built on the bank of the rive Rhine just outside of the city walls of Constance, Germany. All was ready for an execution of yet another heretic, one of hundreds, yes, thousands who shared the same gruesome fate under the brutal reign of the medieval church. Yet this time it was different; it was different in context and also in the outcome. Jan Hus was a professor of philosophy at Charles University in Prague, where he also served for a term as the university rector. At the same time he was a priest and popular preacher in Prague. 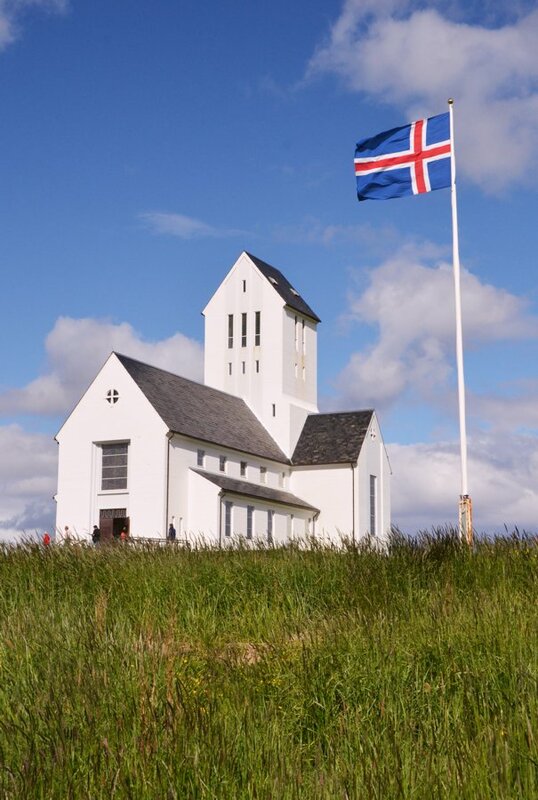 Hus came to Constance to participate in the universal church council which was called to deal with the deep and chronic problems of the medieval church. The most prominent symptom of that crisis were three rival popes (Gregory XII, Benedict XIII and John XXIII) fighting for power. 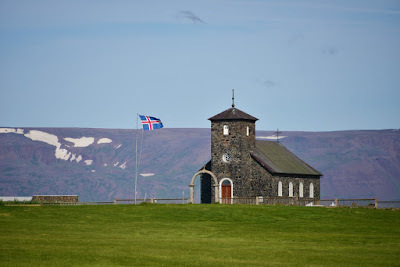 Other symptoms were, for instance, simony (selling and buying church offices for money or favors - church corruption) or selling indulgences (selling divine forgiveness) to finance military campaigns or church offices owning villages and serfs. Eventually, after substantial politicking and maneuvering before and during the council, the papal schism was solved. With the power struggle resolved, anyone who was pointing to deeper, underlying problems in the church was declared a heretic. Jan Hus and shortly after him his academic colleague Jerome of Prague were burned alive. These executions of course did not solve, but only highlighted, those deep problems in the church - its corruption, its proclivity to violence and its public defiance of the way of Jesus. Sparks from the stakes in Constance ignited the Czech Reformation preceding by a full century the Reformation of Luther, Zwingli and Calvin. 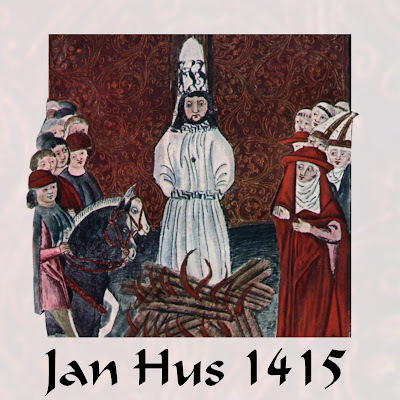 This weekend we celebrate the 600th anniversary of the judicial murder of Jan Hus and the beginning of the Reformation, that striving for a more faithful, serving rather than ruling church, for a more Jesus-like church. This is of course a great simplification of the whole matter. The events were peppered with bitter scholastic syllogisms and examples of human perverse willfulness. For instance, the medieval Roman Church never really burned heretics. The church office only declared people heretics and handed them over to the secular authority of princes. The result was the same - the heretics were burned. Even John Calvin tried to hide behind this syllogism when he had Miguel Servetus executed by fire for non-Trinitarian teaching.